Choose themes specifically designed for lawyers & attorneys. Whether you are a one person shop or have a full staff, your site will be professional and express the personality of your business. With many law firms offering free consultations, the day of a lawyer can be packed between trials and meeting with potential clients that may want for you to represent them. Many busy law firms lose a potential clients interest when they are unable to get ahold of the law firm in order to schedule an appointment. 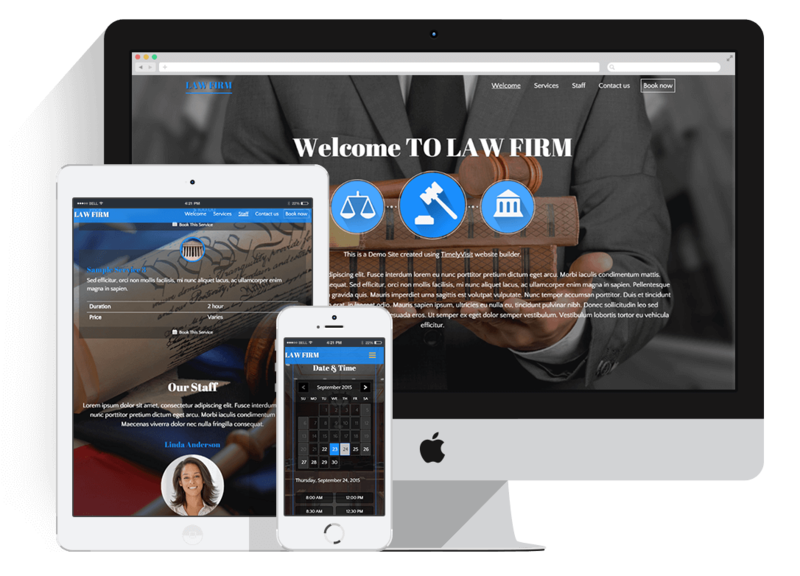 Keep your law firm booming with our easy to setup business websites. Customize the look of your web page to achieve a professional look that will accurately represent you as an attorney. Easy online scheduling will allow your potential clients, or your secretary, to schedule appointments online with a few simple clicks. You can also block out times that you know when you won’t be available, such as when you are out of town at trial, to ensure that there will not be any confusion. Get started today by creating a website with a few simple clicks at an affordable cost.